ebb and flow | Freese and Nichols, Inc. Flooding is a temporary overflow of water onto land that is normally dry. In terms of number of lives lost and property damage, flooding is the most common natural disaster in the United States. Floods can occur at any time of the year, in any part of the country and at any time of the day or night. Understanding your risk and having a plan of action in the event of a flood can help you protect yourself, your loved ones, and your home. This week marks Flood Awareness Week in Texas, made official by a proclamation from Gov. Greg Abbott. 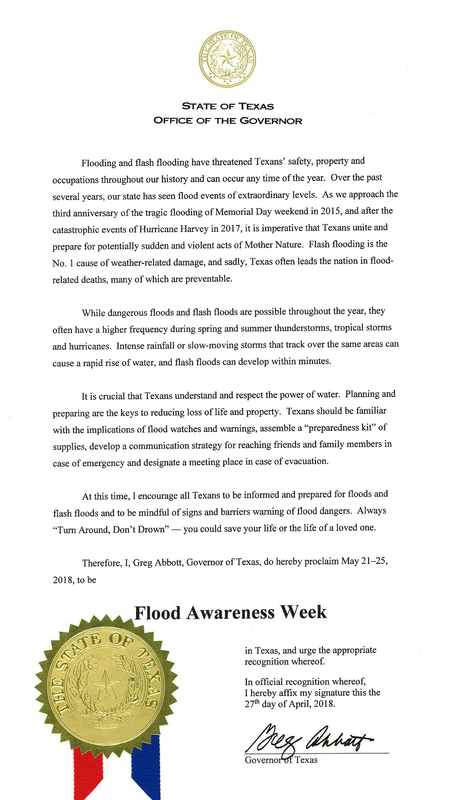 The Texas Floodplain Management Association worked with the governor for the proclamation, which you can read in full here. The Texas Water Development Board’s announcement of the Request for Applications for the Fiscal Year 2018 and 2019 Flood Protection grants has been posted. The City of Houston recently updated floodplain regulations after massive flooding and damages occurred throughout Harris County and surrounding areas in recent years. The flood damages have resulted from major rainfall events; Hurricane Harvey (2017), the 2016 Tax Day Flood, and the 2015 Memorial Day Flood. The regulations were updated to better ensure the welfare and safety of the public and to increase the resiliency of communities as they recover and prepare for future rainfall events. The Texas Water Development Board (TWDB) is developing a State Flood Assessment and is soliciting feedback from communities on flood mitigation to compile this first-ever comprehensive report on flooding in Texas.